Egyptian President Mohammed Morsi defended his rancorous anti-Semitic comments, claiming that they were taken out of context. Morsi asserted in September 2010 that peace negotiations are "a waste of time and opportunities" as Arabs and Muslims get nothing out of engagement with "the descendants of apes and pigs." An Egyptian television shown this month aired the remarks, which were translated and distributed by the Middle East Media Research Institute (MEMRI). "I was talking about the practices and behavior of believers of any religion who shed blood or who attack innocent people or civilians. 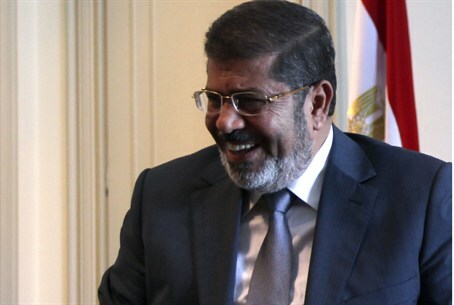 That's behavior that I condemn," Morsi said, after a meeting Wednesday with German Chancellor Angela Merkel. "I am a Muslim. I'm a believer and my religion obliges me to believe in all prophets, to respect all religions and to respect the right of people to their own faith," he said, claiming not to be “against the Jewish faith or the Jewish people." "My comments were about conduct that sheds blood and kills innocent people — things neither I ... nor anyone condones," Morsi added. More recently, as the world marked International Holocaust Remembrance Day, a top aide of the Egyptian president alleged that the six million Jews killed during the Holocaust were not murdered by the Nazis, but were actually moved to the United States in an operation carried out by American intelligence. "The myth of the Holocaust is an industry that America invented," said Fathi Shihab-Eddim, a senior Egyptian aide with closes ties to President Morsi. "U.S. intelligence agencies in cooperation with their counterparts in allied nations during World War II created [the Holocaust] to destroy the image of their opponents in Germany, and to justify war and massive destruction against military and civilian facilities of the Axis powers, and especially to hit Hiroshima and Nagasaki with the atomic bomb," he added.